My approach to both painting and sculpture is to construct something. 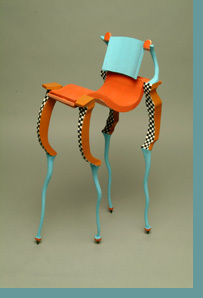 The chair sculptures are built of pieces of wood; glued together, then painted. The earlier paintings are visually built of faux surfaces and architectural spaces. The more recent paintings bring together my fascination with both chairs and surfaces. Hundreds of tiny multicolored chairs painted onto a black ground create an over all texture like galaxies in the night sky. I have always been interested in architecture, and by extension, furniture. The chair sculptures play off of our myriad human connections to real chairs; our own favorite chair; a dining chair, the boss's chair, the king's throne, a dental chair, a child's chair. We look at a chair and make judgments; too hard, too soft, too high, too low, too wobbly, too elegant, too big, too small, just right. The chair sculptures take on an anthropomorphic quality. With personalities of their own they stand alone or interact in small groups; warmly dysfunctional, sometimes funny.